As usually, we see plenty of new rivals in the HYIP world with promising stories to earn money for investors. The program I’m reviewing today is not an exception. It is called BITSHARK and can be easily associated with anyone who is eager to make some money. Of course, there are plenty of other predators in the oceans; however, today it’s all about sharks. BITSHARK has been online already for 11 days and has joined DavidNews.com Golden Stage listing three days ago. I have invested in it $400, in order see the progress and let you know if it’s still paying or not. Let’s move further and see what the shark can offer us! First impressions are important also in the HYIP world. 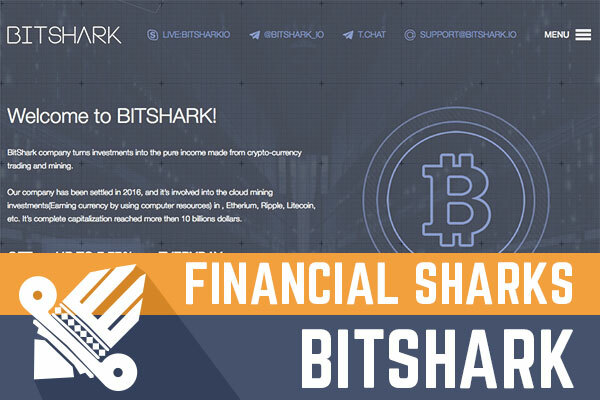 My attention was grabbed by a bitcoin symbol on the BITSHARK website homepage. I believe this gives us a better understanding of their name, which is made up of two parts – BIT and Sharks. Project owners claim that company turns investments into the pure income made from crypto-currency trading and mining. Many of you might have heard of trading, but not all about mining. Mining in the crypto-currency world is referred to the process of adding transaction records to public ledger. Some people and organizations are becoming miners, to make a profit from bitcoin network. I see this a very fast changing environment where artificial intelligence is playing blackjack. So, BITSHARK owners claim that they are involved in the cloud mining investments (Earning currency by using computer resources) in, Etherium, Ripple, Litecoin and other promising crypto-currencies. Of course, there are people who believe they are promising. However, Bitcoin is still the only major game in town! BITSHARK has visible roots in Great Britain. In fact, during the past couple of weeks, I have seen an invasion of new HYIP projects with registered companies in the UK. In other words, there is another company with registration information on the publicly available company register. 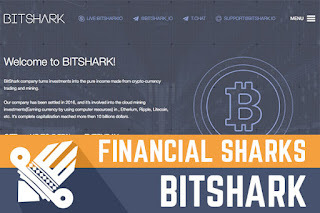 The information of the source also matches details on the BITSHARK website – address, company name, and registration number. Since registration in Great Britain cost around 100 pounds and you can do that online it is no coincidence that HYIP’s are becoming a popular business in London. Just like one of the last UK projects I reviewed, BITSHARK is also targeting two main audiences – English and Russian speakers. I believe you can attract a large audience this way. However, I’m sure that there are many other nationalities, which would appreciate their flags on the language selector menu. It’s not a big deal and will not stop investors from participating here. Moreover, the owners know what they are doing. Especially, if they call themselves BITSHARKS and know how to make money out of crypto-currencies. Even though the website design and layout is very attractive, I must admit that it’s not the best example of a responsive website. The main text on some pages is easy to read and have large letters while on other pages I must use zoom in function, to see what’s written there. I don’t have any details about the use of different devices on HYIP, but for such good example of the web design, this small issue with responsive text and elements on some pages gives a bad aftertaste. I must admit I haven’t seen around such example and most likely it’s a unique design made from scratch. The website has been built on the H-Script, which provides CMS. Last, but not the last – investment plans. BITSHARK has three different investment plans, which accept investments starting as low as $20 and up to $19999. First – 7.77% daily for 20 days. Second – 11% daily for 11 days. Third – 108% after 5 days. In the first and second plan, the initial deposit is included in the payments, but in the third plan, your deposit will be returned with 8% profit after 5 days. If you are new to HYIP world, then don’t get too excited about the interest rate of 108%. In fact, it looks impressive, but it will not make you rich compared to two other plans. It’s just the way HYIP owners present interest rates for some plans. Always pay attention only to profit and don’t get fooled easily by high-interest rates. Just to give you a better understanding of potential earnings here. $100 investment in the first plan will make you $55.50 profit at the end of it – after 20 days. The same $100 investment in the second plan will make you $21 profit at the end of it – after 11 days. Finally, $100 investment in the third plan will make you $8 profit at the end of it – after 5 days. BITSHARK owners have made a very simple and convenient calculator for all three plans. Often, I see calculators with sort of a creative design, but very slow and inconvenient. In this case, you can choose a realistic size of investment for calculations. 20, 50, 100 and higher amounts. In terms of BITSHARK longevity, it has been online for 11 days already and deposits made in the second investment plan on the first day should be returned. However, the third plan investments already have made two full cycles. For the first plan investments, there are another 9 days to go. Sure, most of the programs don’t attract investors at the very first day, and these calculations are just an assumption. For some of you a very important thing to mention – BITSHARK claims to provide instant payouts any time or day. Moreover, a deposit made will be making a profit every day no matter if it’s a business day or not. This is a catch, which is not always well explained in some programs. Well, I have mentioned a lot, and hopefully, you can read between the lines, to make your decision about BITSHARK. Even though, we all know the unpredictable nature of HYIP and the fact that they are made to make money for the owner and bunch of other folks, I must admit that the website and program, in general, looks good. However, pay attention to the fact that I’m talking here only about the facade, investment plans and functionality of the website. Be aware that most of the stories and text are written on the HYIP are fiction. The decision to risk your own money and invest or not is 100% your own decision. Therefore, always evaluate investment risk and invest money that you can afford to lose! Investment plans: 7.77% daily up to 11% daily for 11 up to 20 calendar days, initial deposit included in the payments. 108% after 5 calendar days, initial deposit included in the payment. If you're searching for the most recommended Bitcoin exchange service, then you should pick YoBit. Did you ever try to maximize your free BTC collections by using a BITCOIN FAUCET ROTATOR?